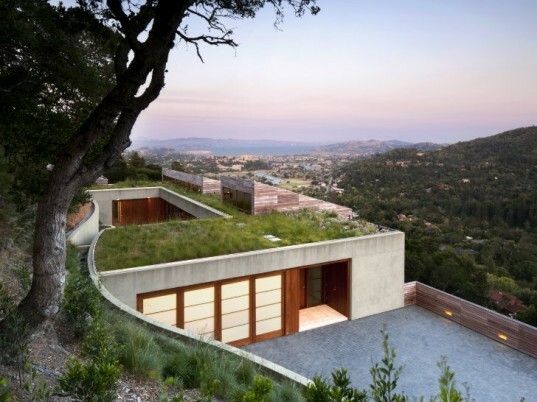 The Kentfield Hillside Residence rises up from beneath a living roof in Marin County, to the north of San Francisco. With views of Mount Tamalpais and the San Francisco Bay, this stunning home is anchored into the hillside and becomes one with its surrounding environment. The two story home was designed by Turnbull Griffin Haesloop Architects and it employs a number of sustainable strategies to reduce its impact. Located in Kentfield to the north of the Bay, the Hillside Residence is a green-roofed beauty with captivating views of the surrounding landscape. Designed to engage as well as fit in with the surrounding landscape, the home features natural building materials and is capped off with a living roof. A curved retaining wall follows the contour of the back hillside and anchors the home into the earth. In the back is a small lap pool contained within a private courtyard that is sheltered from the wind but soaks up all the sun. Two stories with 5,900 sq ft of space, the main living and dining rooms are on the top floor. Natural daylighting, ventilation as well as passive heating and cooling work to reduce energy use. Shed roofs angled towards the sun emerge from the green roof and serve as the foundation for the photovoltaic and solar hot water panels. The home also features radiant floor heating, battery storage, rainwater harvesting and collection in a cistern. 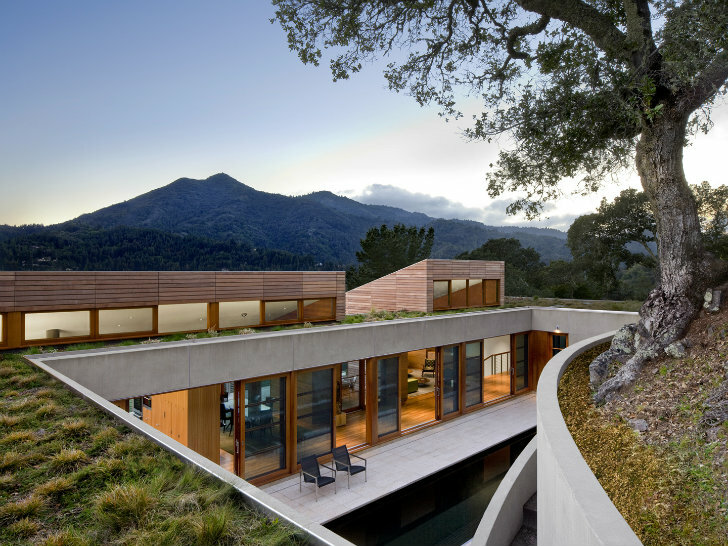 Located in Kentfield to the north of the Bay, the Hillside Residence is a green-roofed beauty with captivating views of the surrounding landscape. Designed to engage as well as fit in with the surrounding landscape, the home features natural building materials and is capped off with a living roof. A curved retaining wall follows the contour of the back hillside and anchors the home into the earth. In the back is a small lap pool contained within a private courtyard that is sheltered from the wind but soaks up all the sun. Two stories with 5,900 sq ft of space, the main living and dining rooms are on the top floor. Natural daylighting, ventilation as well as passive heating and cooling work to reduce energy use. Shed roofs angled towards the sun emerge from the green roof and serve as the foundation for the photovoltaic and solar hot water panels. The home also features radiant floor heating, battery storage, rainwater harvesting and collection in a cistern. The home was completed in 2010. Daylight floods the interior of the home and the wood paneling provides a warm atmosphere.